There’s plenty to go over from Week 10 in the NFL, including why the Bengals’ fourth-down try was actually a good play ruined by the redemptive individual effort of James Ihedigbo, how the Bears asked the impossible of center Richard Garza on their failed two-point try at the end of the game, and how old dog Carson Palmer showed he can still hang in once in a while against pressure for the Cardinals. But first we’ll start with how well-traveled veteran cornerback Will Blackmon helped the Jaguars get their first win by learning from a previous play to force a fumble and return it for a game-winning touchdown. 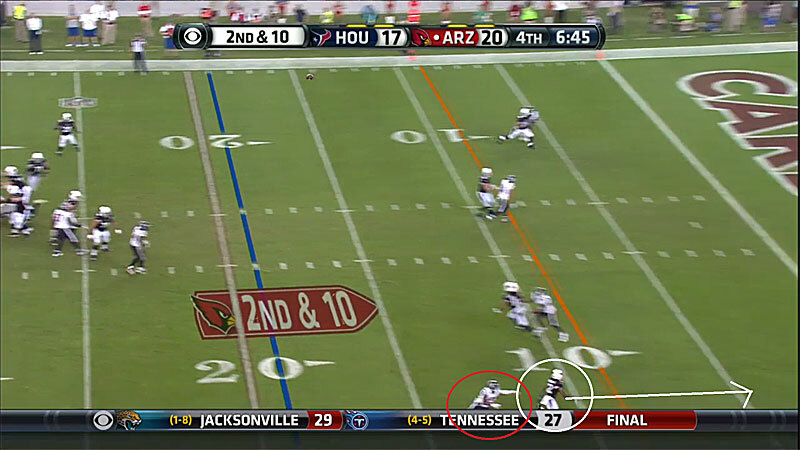 What happened: On the previous play, Blackmon was lined up to the offense’s left as the slot corner. He was asked to blitz, but left tackle Michael Roos easily snuffed it out and erased Blackmon. From the opposite side of the field, the same call came in. On third down, Blackmon (24) was lined up opposite receiver Kendall Wright (13), not far from left end Jason Babin (58) and defensive tackle Sen’Derrick Marks (99). The Titans had enough hats in backup center Chris Spencer (60), right guard Chance Warmack (70) and backup right tackle Mike Otto, but the Jaguars’ movement threw a wrench at the protection. Marks and Babin ran a game that had Babin loop around to the middle. Both Otto and Spencer dealt with Marks—while Warmack basically tackled Babin—and that caused Otto to see Blackmon late. Blackmon sped around the corner and got a piece of quarterback Ryan Fitzpatrick’s arm, causing him to fumble. The ball bounced right to Blackmon, who returned it for his first touchdown since 2008, when he was the primary punt returner for the Packers. “I’m just going for the ball,” Blackmon said. “You figure the most careless person on the field with the ball is the quarterback. He was trying to pick it up, but I just took it from him. The play was special for a player who went on injured reserve in 2007 with a foot injury and in 2009 after ACL surgery. Blackmon joined the Giants in 2010 and again in ’11 before needing another knee surgery to get the knee right. He missed all of the 2012 season and was released by the Seahawks in August before the Jaguars picked him up. “I love playing football and playing for my teammates,” Blackmon said. “It’s a testament to just believing that I can get through all of this stuff and still play at a high level, and that all the hard work I put in—I sat out for a full year, 365 days—was worth it, and if you just stay positive and believe that things will come. It’s real cool feeling right now. “I was going to find a way [back into the league]. I didn’t know when or how, but it would happen eventually. It was a delay, not because of ability, but because of my health. That’s why I still had hope. Result: Andy Dalton pass to Giovanni Bernard for an 11-yard loss that set up the Raven’s game-winning field goal. What happened: On the final play of regulation, Ravens safety James Ihedigbo tipped a Hail Mary right to Bengals receiver A.J. Green for a 51-yard touchdown, which wiped out a Baltimore victory and sent the game into overtime. 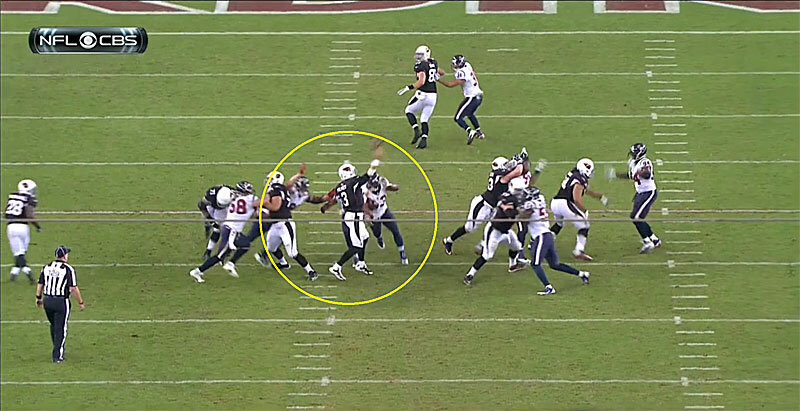 Instead of lingering on that, Ihedigbo had the play of the game in overtime. Bengals coach Marvin Lewis chose to go for it on fourth down instead of attempting a 50-yard field goal into the wind or punting. With the Ravens showing man-to-man coverage across the board, this designed swing pass to running back Giovanni Bernard should have worked. The Bengals had all the momentum going to the left, with Bernard swinging out to the right. If the Ravens stayed in their man coverage, there should have been enough rubs and picks to get Bernard free to pick up the first down. But because the Bengals ran a similar play earlier, the Ravens were going to switch their coverage responsibilities depending on how Bernard and tight end Tyler Eifert (85) came out of the backfield. Ihedigbo was the only Raven who could have slowed up the play, because the rubs were working so well that CB Corey Graham (24) and Brown collided in pursuit. To get in position, Ihedigbo had to beat right tackle Andre Smith’s block—which he did—and then break down and tackle the elusive Bernard in the open field. The slightest screwup in his pursuit or in his attempted tackle, and Bernard was going to pick up the first down. Ihedigbo executed perfectly, forcing Bernard to double back to where Graham finally made the tackle for an 11-yard loss and change of possession that led to the Ravens’ game-winning field goal. What happened: Handed another chance after a roughing-the-passer penalty by DE Willie Young on the first, failed, two-point attempt, Bears coach Marc Trestman gave backup quarterback Josh McCown a run/pass option depending on how the defense lined up. With just four defenders to the left of center—and four Bears, including receiver Brandon Marshall, to block them—McCown correctly checked to the inside zone run to the left, behind center Roberto Garza (63) and left guard Matt Slauson (68). The most important block on this play is against Fairley (98), who is lined up on the inside shoulder of Slauson. For the play to work, Garza has to “reach block”—literally reach his left arm to Fairley’s outside shoulder—and seal him off to the inside, with Slauson taking out linebacker DeAndre Levy (54) on the second level. "I've just got to make that block," Garza told reporters after the game. "That's all it comes down to." But this is a nearly impossible block for Garza to pull off by himself given Fairley’s talent and where he is lined up. On this play, Slauson’s duty is to slow up Fairley enough to give Garza an opportunity to get the angle on Fairley, before Slauson takes the linebacker. That didn’t happen. Slauson barely touched Fairley, who probably ruined the play just by how quickly he fired up field—he was the first player on either team to react to the snap. Even if the Bears found a way to contain Fairley, it’s doubtful the play would have worked, because of other failed blocks. LT Jermon Bushrod didn’t finish the block against Young, Slauson didn’t slow up Levy, right guard Kyle Long got tripped trying to finish against MLB Stephen Tulloch, and Marshall didn’t execute a crack-back block against anyone. Just an all-around failure in execution, starting with an impossible reach block against Fairley. What happened: Cardinals veteran quarterback Carson Palmer hasn’t performed well when under pressure so far this season, which is could explain why Texans defensive coordinator/interim head coach Wade Phillips made the curious decision to call an all-out blitz on second-and-long with plenty of time remaining. Nickel cornerback Brice McCain (21) went with receiver Andre Roberts (12) as he went in motion across the formation. 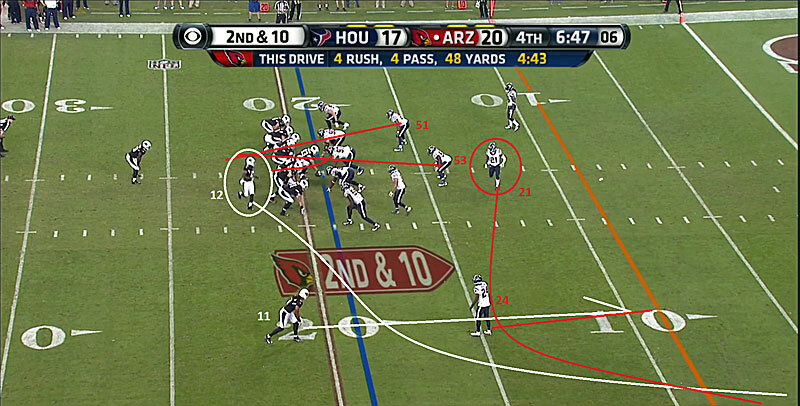 Johnathan Joseph (24) drew receiver Larry Fitzgerald (11). 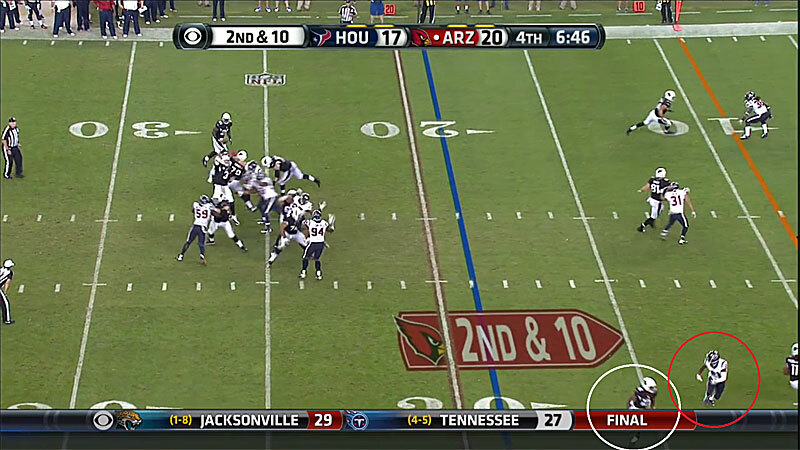 Because the Texans weren’t going to switch on this play—there wasn’t an obvious pick coming since Roberts and Fitzgerald weren’t aligned together—McCain had two choices. He could be aggressive on a possible pass to the flat, or play conservative and bubble over the top of Joseph to keep from giving up the big play. McCain was aggressive, and when it turned into a double move with a wheel route on the back end, McCain was too shallow and Roberts had an easy touchdown catch. “We set it up earlier, a flat wheel route that we were trying to setup and we executed it well,” Roberts said. 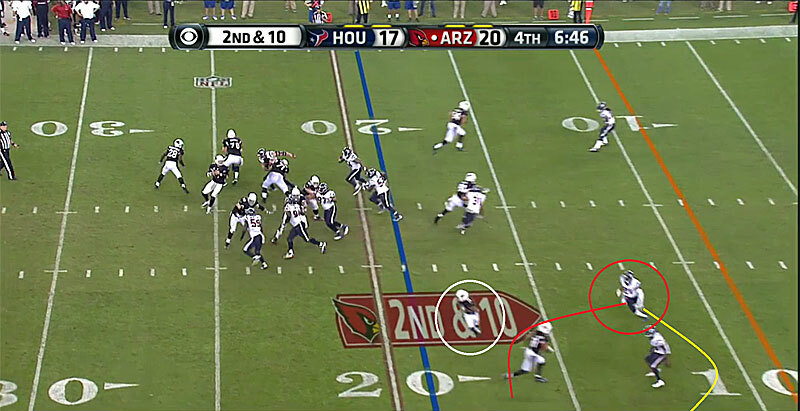 But it was a far from easy play because Palmer had not one but three Texans taking a direct shot at him. Yet he stood in, delivered the ball and got blasted in the process. Phillips was only left to second guess himself after the game.